But it isn’t always so obvious when we are moving into an unbalanced state, although we certainly can feel ‘out-of-whack’ and intuitively sense that something is not quite right. In the larger picture though, we live in a very “masculine” society: that doesn’t mean that we live like men as such, but rather that our lives are filled with action, light, heat, moving forward, and expending lots of energy. That’s what “masculine” energy means in a spiritual sense. This masculine energy is represented in Buddhism as the figure of the sun. On the other hand, “feminine” energy means just the opposite: passive, dark, cool, staying still and drawing energy inwards. This feminine energy is represented in the figure of the moon. In our society, however, being active and moving forward are seen as positive traits, whereas being said to be “passive” is viewed negatively and implies laziness and of not being seen to be doing something. However, this is also how we “burn out” – think about that… burnt out, as if we have gotten too hot and melted and there has been nothing to cool us down. So it is essential to our physical as well as spiritual wellbeing to take time out and just be still. Rather than being lazy, it is the way that we can return to the balance that is vital to living a peaceful yet fulfilling life. 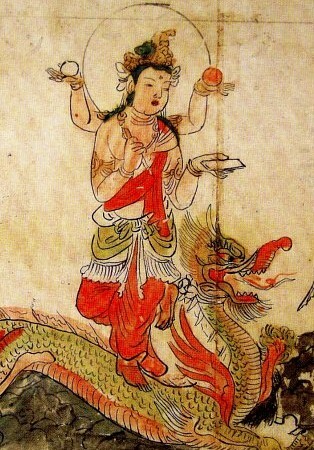 This image of the masculine hot sun and the feminine cool moon is used extensively in Buddhist art, but recently I found that this symbolism has also been used in Medieval Europe in the context of alchemy and even as far back as ancient Egypt. 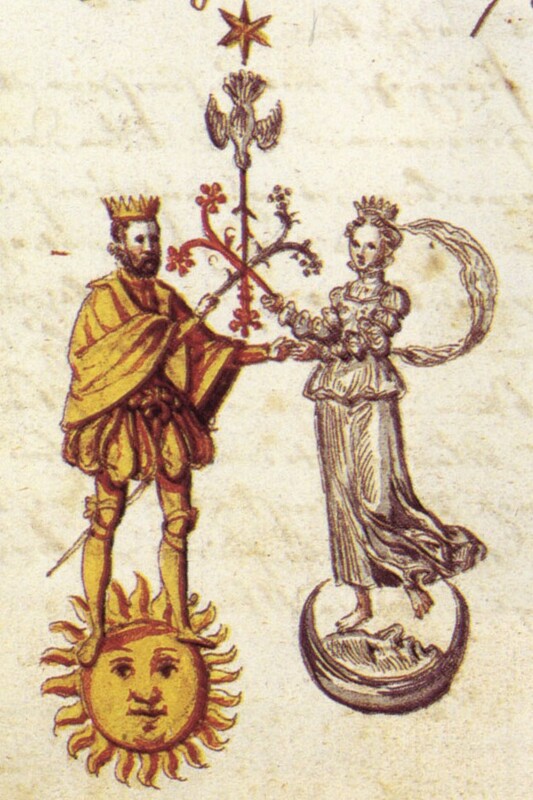 In alchemy it refers to the “Chymical Wedding”, which is the union of the masculine and the feminine so that a new perfectly integrated whole can be achieved that joins all opposing aspects of our nature into the Divine One. This is the spiritual alchemy of Medieval mystical Christianity. The psychiatrist Carl Jung used this imagery also as a means of finding balance psychologically in one’s life. I use the symbol of the sun and the moon a lot in my own meditation and awareness practice, and it is quite easy to feel when I’ve heated up too much and need to draw energy inward instead of expending too much. But even after many years of concentrated effort I still find it difficult to give myself the space I need to be quiet, without feeling like I should be doing something else. The masculine side of our society is so deeply entrenched it takes time… well, to give ourselves just free time! So right now I’m sitting outside in my garden as the sun is shedding that special winter light that filters green through the new nasturtiums and glints off the water in the birdbath as the little Honey Eaters descend for their ritual bath. Aaah……Breathe out……switch off the computer now and go somewhere to sit quietly for just a few minutes – that’s doing something! This entry was posted in Buddhism, Meditation, Spirituality and tagged alchemy, feminine, masculine, moon, sun. Bookmark the permalink. The word “harmony” has been coming to me a lot lately. Thanks for your message. Thank you for your comment – yes, we intuitively know that harmony is what we need but it is difficult to keep it in our consciousness when we are always so busy with juggling the everyday needs of life, isn’t it. That’s why it is so important to take time to be still – even for one minute. In fact, I’ll talk about my “one minute meditation” next time… so stay tuned!